THROW IT AWAY is a Nine Inch Nails themed podcast. Episodes revolve around discussion of NIN news & events, as well as general NIN discussion. Conceived in March of 2014 by Alex Gertsma and Tito Danger Burns. http://throwitaway.net/ became active in May 2014 and was created by Danny Mantyla. The three have been friends since high school and have traveled far and wide to see NIN together over the years. THROW IT AWAY’s first episode was released on Bastille Day (July 14) 2014 and is currently scheduled to maintain a monthly release for the foreseeable future. Up in the Pacific Northwest, Alex is based out of Seattle, with Tito in the San Francisco area and Danny joining in from Lawrence, Kansas. 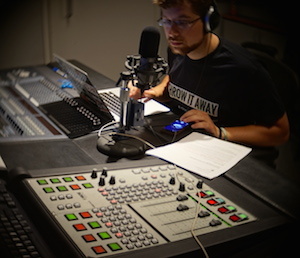 As of summer 2015, Johnny has joined the podcast to offer his audio technical expertise. In addition to discussion between the three, guests who have demonstrated a love of NIN (and/or relevance in the NIN community) are invited onto the program. THROW IT AWAY also maintains a presence on social media (Facebook, Twitter, etc.) and on Echoing the Sound in order to maintain contact with the NINternet and NIN community. 'Throw it away' is taken from the ending lyrics of "Gave Up" (from Broken Halo 5). "Throw This Away" (from Fixed Halo 6) and "Throw This Away" ("TIA Version" - by Tito 'Feel Your' Danger Burns) are currently the two theme songs that play during the opening/closing seconds of each episode. This page was last modified on 31 October 2015, at 10:23. This page has been accessed 5,140 times.